The results are in and they are bleak, even, according to many, cataclysmic: for the first time in recorded history, the far-right National Front came first in a national election in France, garnering 25 percent of the votes in Sunday’s European Parliamentary race. France has now the distinguished privilege of being the only European nation, save Denmark, where a violently anti–European Union, anti-immigration, nationalist party leads, and by far. Marine Le Pen had her new posters ready for election night: “National Front, First Party of France,” they read. This new slogan, albeit inaccurate (one election, specifically the notoriously unrepresentative, abstention-prone European one, does not accurately measure a party’s overall strength), was hard to shake off. Prime Minister Manuel Valls spoke of “a shockwave” and “a seismic tremor.” Editorials and politicians escalated the natural catastrophe imagery, evoking an “earthquake” (Jean-Marie Le Pen), “a volcanic eruption” (Jean-Luc Mélenchon) or a “Big Bang” (Le Parisien). On everyone’s minds was the precedent “shock” of April 21, 2002, when Jean-Marie Le Pen landed second in the presidential race and left a stunned Lionel Jospin, then prime minister and the socialist contender, in the dust. Yet this time around, and seismological metaphor notwithstanding, it is the expression of surprise on the faces of the political class that was startling. Contrary to natural catastrophes, Sunday’s political landslide was human-made and predictable. Opinion polls in the weeks leading to election night were remarkably consistent. On Friday, May 23, the definitive rankings were already projected by a Ipsos-Steria survey for Le Monde and the Cevipof: the estimates—24 percent for the National Front; 21 percent for the conservative party UMP and 17.5 percent for the Socialist Party—proved fairly accurate, except that the Socialist party, currently in power, ended up crashing at a meager 14 percent, its worst election result ever. This outcome was also the logical conclusion of a string of political betrayals, scandals and mismanagement that were only compounded by the persistent economic and social morass that has plunged France into perpetual gloom. Other European countries had it worse than France on the economic front in recent years and yet did not succumb to the sirens of the radical right: Spain, Portugal and Ireland, for instance, know a thing or two about austerity and double-digit unemployment rates, but protest votes took other forms than anti-immigration vociferations. There is no hiding the fact that France has a long been obsessed with immigration. It has an even longer tradition of leaning towards “Bonapartist” leaders, specifically in times of uncertainties. The repeated flip-flopping of the right and the left on economic and fiscal issues; their tepid embrace of the European Union, championed half-heartedly at best, but more often criticized as “too German”; the divisive and risible ego battles within the UMP leadership (which has now imploded in midair with the revelation of ten million euros’ worth of illegal campaign funding for President Sarkozy in 2012); the rigid incompetence of the current administration (now at a record low with an 18 percent approval rating); and the overall impression that socialists and conservatives are pursuing the same policies under different names: all these factors have been fertile ground for the National Front. The universe hates a void; so does the political arena. In the vacuum left by petty rivalries and muddled ideologies the National Front has emerged as a solid, reliable, untainted and untested alternative. While left and right have become illegible and interchangeable, the National Front offers a consistent, coherent and clear ideological platform that never wavers from its axis (the defense of the nation), and—bonus point—its leaders come with clean hands. Instead of a “seismic shock,” and the admission of powerlessness that the image suggests, one should rather speak of a falling out, a divorce even, between the political class and an increasing number of citizens. A divorce that turned all the more ugly for the high hopes that were repeatedly crushed and promises of amends that never came true. Those who have suffered the most from the impact of globalization on the structure of the French economy see nothing for them in the European Union and the ruling parties that support it. The divorce is next to complete. The falling out comes with a falling in. And the seducer is a seductress: blue-eyed, strong-willed Marine. The new leader of the National Front has beefed up the anti-capitalist streak of her movement while sugarcoating her father’s xenophobic agenda. She taps into the social and cultural aspirations of an increasingly desperate working and lower class fed up with political corruption and low wages, anxious about its social decline and threatened in its cultural identity by a multicultural, foreign world. But her strategy is even more pernicious, and potentially more damaging than this traditional “brown-red” conflation: she also consistently presents herself as the sole champion of democracy, freedom, laïcité, social justice—as, even, the spiritual daughter of de Gaulle and the Resistance, calling recently for “La France libre!” (“Free France”). At stake in the custody battle will be France’s moral and historical legacy: Who will get to be the guardian of the Republic’s principles? Will someone stand up to breathe a renewed, tangible humanistic meaning into the words of the Republic, or will Marine Le Pen be allowed to hijack and distort them, as she is slowly but surely attempting to? After the “shock” of April 21, 2002, more than a million people took to the streets to march peacefully against the National Front. Families, parties, unions, all rallied regardless of political affiliations to bar Jean-Marie Le Pen from power (only later did the latter admit that he was as surprised, and unprepared, as everyone else: Louis Aliot, then Jean-Marie Le Pen’s secretary and now a European MP and Marine Le Pen’s companion, recalled when I interviewed him last June that when he said to Le Pen, “Sir, we could get elected!” Le Pen replied, “God forbid!”). Jean-Marie Le Pen not only lost the 2002 elections, he actually lost votes between the first and second rounds. Fast forward to the present: the political class might be shaken by the May 25, 2014, results, but 51 percent of the French polled are either “satisfied” or “indifferent” to the score of the National Front. No one is taking to the streets. 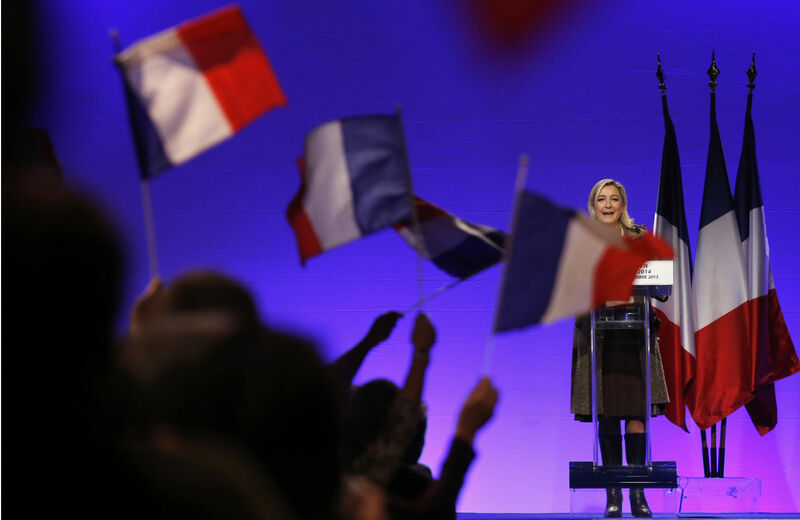 A highly scoring, and even domineering, National Front has come to be seen as the new normal. Now that is shocking news.